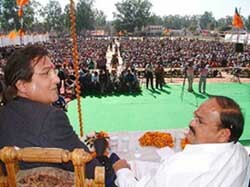 Asserting that the BJP would be staging a “thunderous” comeback with a clear majority due to the ongoing “Atal aandhi”, which was “sweeping” not only the North but the entire country, the BJP today put all speculations to rest by announcing that the party won’t have any “poll reliance or alliance” with the BSP in Punjab. 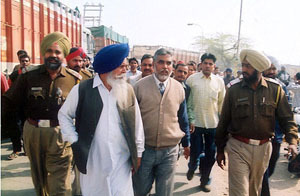 In view of the coming Lok Sabha elections, the Shiromani Akali Dal (SAD) today got a shot in the arm when a former Punjab minister in the previous Congress government (1992-97) and a Nationalist Congress Party (NCP) leader, Chaudhary Abdul Gaffar, and a former Administrative Member (AM) of the Punjab State Electricity Board (PSEB) and expelled SAD leader from Dirba, Mr Gurbachan Singh Bachi, joined the SAD here. Mounting a sharp attack on the former Punjab Chief Minister, Mr Parkash Singh Badal, the SAD (Amritsar) President, Mr Simranjit Singh Mann, said that Mr Badal and his close associate, Mr Sukhdev Singh Dhindsa, were new “maharajas” of Punjab. Will Cabinet come to their rescue? Ms Surinder Kaur Badal, wife of the former Chief Minister and SAD president, Mr Parkash Singh Badal, was today granted conditional permanent exemption from personal appearance by the Special Judge (Ropar), Mr S.K. Goel, in the corruption case against Badals. The conditions are that she would have to appear in the court at the time of framing of charges or whenever summoned by the court. Asking the SAD President, Mr Parkash Singh Badal, and his son, Mr Sukhbir Badal, to stop eulogising themselves, Punjab Chief Minister, Amarinder Singh, said here today that both Mr Badal and his son should not forget the fact that they had been released from judicial custody on bail in a “corruption” case. The Punjab Chief Minister, Capt Amarinder Singh, yesterday said 2004 would be observed as the year of education and health for all. The stock of highly explosive materials like RDX and PNET lying in the ‘malkhana’ of the judicial complex have been handed over to the Army authorities here for its disposal. Three-month-old ‘Khushi’ with calcified kidney, who was abandoned by her parents is waiting to be adopted by one of two prospective Delhi-based couples. 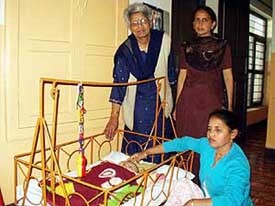 This is the result of a unique “window-cradel” with an electronic sensor that has been serving as an avenue for over 200 abandoned new borns to rehabilitation childless homes for the past 20 years at the Pushpa Gujral Nari Niketan on Nakodar road. The Congress is in a fix as far as its electoral and power politics is concerned in Punjab. Though the party’s major vote bank is based in the urban areas yet its power and party structure do not reflect the same. Informed sources said that the party was under strong pressure to correct the power imbalance by nominating Hindu candidates for Lok Sabha elections from the main urban constituencies. The Akali Dal will contest the forthcoming Lok Sabha elections from all 13 seats in Punjab, even if does not get support from any political party. Great suspense maintained by the BSP regarding its electoral strategy has put the Congress and SAD in quandary in Punjab and other states. The revolt in the Shiromani Akali Dal (SAD) in Patiala on the issue of announcement of the candidature of former Finance Minister Capt Kanwaljit Singh seems to be ebbing with former MP Prem Singh Chandumajra, who had staked his claim to the party ticket, today claiming that he would fight for his rights by remaining in the party. Hundreds of truck operators today blocked traffic for hours on the Bathinda-Barnala national highway and gheraoed a senior official of the State Transport Department for his alleged involvement in illegally collecting money from truck drivers. Mr Sajjan Kumar Jakhar, former Cooperation Minister, yesterday presented a cheque for Rs 84,000 to the family of Mr Balkar Singh who had died due to squall at Jandwala Meerasangla village near the international border last year. The son of Mr Balkar Singh received the cheque under the Sankat Haran Insurance Scheme offered by the Indian Farmers Fertilisers Cooperatives to its customers free of cost. A three-day international seminar on ‘Guru Granth Sahib — formation, unique status and place among scriptures’ concluded here yesterday. Mr Parmod Kumar, Principal, Senior Secondary School, and in charge, flying squad for the Class VIII examination conducted by the Punjab School Education Board of Samana subdivision, today raided DAV School, Kakrala, 15 km from here, and caught Mr Balbir Singh of the school while he was allegedly helping a student to cheat. The cremation of Sandeep Singh, Dalit boy allegedly shot by Harnek Singh, Principal of Senior Secondary School, Chhajjalwadi, yesterday, took place at Tangra about, 25 km from here, this evening A large number of relatives and villagers attended the cremation. However, the police failed to arrest the Principal even today. 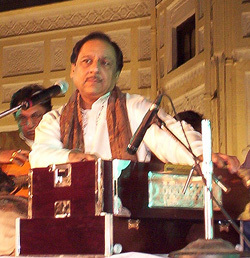 Ghulam Ali remains humble to the hilt, yet he takes no credit for what he is. So at the Heritage Festival here last evening he attributed his success to his ustads from the Patiala Gharana. The first submission he made after occupying the dais against the backdrop of the Old Moti Bagh Palace was, “Yeh sheher mere ustadon ka hai. Salma Sultan, Doordarshan hostess of yesteryear, continues to charm as ever. Out of sight, but certainly not out of business, the elegant and talented television newsreader is on the verge of re-establishing her link with Doordarshan, which continues to be the channel of her choice, irrespective of the plethora of channels on air. Throw in 15 top-notch models along with three well-known designers. Add to this glamour noted choreographer Harmeet Bajaj can lend to an event. And you are sure to witness a gala affair. The grounds at the National Institute of Sports here were aglitter with beauty and poise as well-known faces of the advertising world rehearsed the catwalk. The final day of the ongoing Patiala Heritage festival will see a confluence of cultures, with famous Pakistani Pop-band ‘Junoon’ sharing the space with Gursewak Mann from India and Stereo Nation from London. Bhagwant Kaur of Churpur village, near here, has been embroidering phulkari motifs all her life, but has made no financial gains. 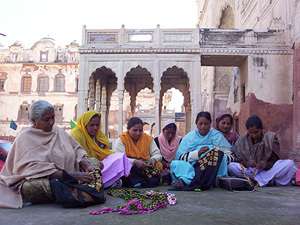 Now, she and other women, who participated in a two-day workshop at Quila Mubarak as part of the Heritage Festival, have decided to form a self-help group to market their craft in coordination with non-government agencies. Finding merit in the allegations of Mr Raja Ram, a farmer of Bishanpura village of this subdivision, and Mr Justice R.L. Anand, a Member of the Punjab State Human Rights Commission, has called for a report from the Secretary, Home Department, Punjab by May 31, 2004. District and Sessions Judge S.N. Aggarwal yesterday sentenced Dev Kumar and his wife Maya Devi to eight years in jail while Gopal Rai, the husband of the victim, Seema, had been declared proclaimed offender in a dowry death case and was reportedly presently living in Australia. Mr Ranjit Singh, Judicial Magistrate, yesterday sentenced Jagnandan Singh Pathania of Shanti Investment Company, to six months fined him Rs 5,000. The police authorities have constituted a Special Investigation Team (SIT), headed by the DSP of Phul, to investigate the murder of a liquor contractor, Darshan Bajakhana. The local police has busted an inter-district gang of five dacoits by arresting all five gangsters, including its kingpin Lakhwinder Singh, alias Raja. The Vigilance Bureau yesterday arrested revenue Patwari Balwinder Singh posted in a village here on charges of accepting bribe Rs 700 from a Tehsildar. The Industrial Training Employees Union, Punjab held a rally here to express resentment over the state government’s move to privatise about 12 non-functional ITIs in Punjab. The employees, who had arrived from different towns, took out a protest march shouting slogans against the government led by Capt Amarinder Singh. The Punjabi Language Development Department of Punjabi University organised Gyani Lal Singh memorial lecture in connection with Mother Tongue Day yesterday. The Dean, Academic Affairs, Dr U.C. Singh, presided over the lecture. Educational institutes cannot live in isolation. They must connect themselves with the community. These remarks were made by Prof Ved Parkash, Secretary, University Grants Commission (UGC), New Delhi, while speaking on “financial and other planning of the UGC” at Guru Nanak Dev University here today. The Vice-Chancellor Punjabi University, Mr Sawarn Singh Boparai, inaugurated the Advance Centre for Technical Development of Punjabi Language, Literature and Culture here today.